With Justin’s pollinator efforts at the center of the humane, earth-friendly company, we spoke to Alyssa Harding, external relations manager at Justin’s, to find out what all the buzz is about. Bees. They’re not something we necessarily have empathy for. But Justin’s says we should. Why? We’re joining forces with Xerces Society, People & Pollinators Action Network and Growing Gardens to do our part at the local, state and national levels. None of it alone will solve the problem, but together, and with the help of others, we can save the pollinators – and in the process, delicious food. Which foods – Justin’s and otherwise – require pollinators like bees? About 80 percent of the world’s food crops require pollinators, which means that our meals would be pretty sad without them. There are so many foods that we would lose without pollinators. For example: apples, mangos, alfalfa (which many livestock animals eat), okra, strawberries, onions, cashews, cactuses, apricots, avocados, passion fruit, cherries, celery, coffee, cocoa, vanilla, cranberries, tomatoes, grapes and so many more. So, what does this mean for Justin’s? Without pollinators, there would be no Justin’s! Consider almonds, the primary ingredient in Justin’s line of almond butters. It takes two beehives to pollinate a single acre of farmland. At about 20,000 bees per hive, you need more than 36 billion bees to keep this vital almond source going. Herein lies the problem: California beekeepers have only a quarter of the hives needed, based on the number of almond orchards. And over the past few decades, there has been a significant pollinator decline due to pests, pathogens, poor forage and pesticides. Furthermore, 40 percent of invertebrate pollinators are on the verge of global extinction. How serious is this issue in terms of the earth? Beekeepers have reported a loss of about 40 percent of honeybee colonies per year, and based on the number of almond orchards in California, beekeepers in the Golden State have only a quarter of the hives they need to pollinate their crops. In January 2017, the Rusty Patched Bumble Bee was the first bee in the continental United States to be listed under the Endangered Species Act. What nonprofit organizations is Justin’s teaming up with? To start, Justin’s is teaming up with The Xerces Society, a nonprofit group recognized internationally as a leader in pollinator conservation. Over the past four decades, it has focused on protecting endangered species and their habitats, produced groundbreaking publications on insect conservation, and trained thousands of farmers to protect and manage habitats. 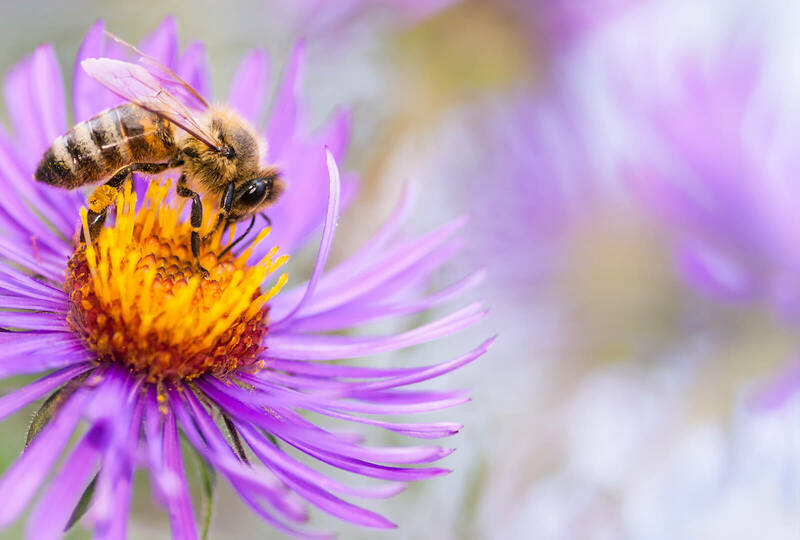 At the state level, we’re proud to support People and Pollinators Action Network (PPAN), a Colorado-based organization that works to promote sustainable agricultural practices and improve our environment by creating movement to build community awareness, change policies and support best practices in pollinator conservation. In our own backyard in Boulder, Colo., we’re joining forces with Growing Gardens, a local nonprofit dedicated to enriching lives through sustainable, urban agriculture. Our contribution and volunteer days will replace 16 hives and help to plant and maintain Growing Garden’s pollinator garden. In addition, we’ll be providing scholarships and classroom visits for 800-plus children to learn about pollinator conservation. Little things can make a big difference. By providing food, water and habitat, you can do your part to protect these critical species. Your home and garden are the perfect place to start. Planting regionally-appropriate wildflowers is another simple way to help bees and contribute to pollinator conservation. Plus, it’s fun and pretty! Business aside, why does Justin (the leader of Justin’s) care so much about this issue? Justin grew up in a small mountain town in Pennsylvania, where his family owned and operated a small natural foods store. It was here that he acquired an early awareness, education and appreciation for natural foods. At the same time, he was frustrated by the lack of taste and variety in his vegetarian diet and thus, his entrepreneurial drive and spirit of irreverence were born. Justin’s passion lives on in the business decisions we make every day at the company that bears his name. At Justin’s, our values stem from a sense of passion, innovation and corporate consciousness. This mindset has helped to create Justin’s four fundamental pillars – nourish, nurture, inspire and educate – that guide our social responsibility initiatives and company operations as we grow and develop. We have various sustainable initiatives, such as sustainable ingredients, packaging and sourcing, as well as a variety of programs that we support to parallel each of our fundamental pillars. Some of the organizations that we support are Naturally Boulder, Conscious Alliance and Thorne Nature Experience. Justin’s is also working with Colorado University’s MENV Program to collaborate on sustainable supply chain projects and research. We’re one of the first companies to work with this degree program. Finally, we presented our sustainable palm oil project at the beginning of June and will also be working on hunger relief programs later in 2017. Lastly, can we talk quickly about the dark chocolate peanut butter cups? They are everything. Yes! Dark chocolate peanut butter cups have the biggest cult following. I am part of that club myself. Just imagine what happens when you take the best-tasting organic peanut butter in the world and delicately place it into the highest quality, organic and Rainforest Alliance-certified chocolate available. It truly is peanut butter cup perfection!